Recently, we learned how lifestyle inflation can be toxic. In case you’re wondering, there is a time and place to inflate your lifestyle. However, you can’t just do it whenever you want. You have to earn it. Here’s how it works. If your goal is financial independence, I recommend that you live on half your income and save the rest. If you have a higher income, such as $100,000 per year, your savings goal and taxes increase, but so does your allowable yearly spending. Therefore, this is one way to earn an inflated lifestyle. The chart below shows goal savings, estimate taxes, and allowable yearly spending for various income levels. The estimated taxes are very rough estimates, based upon a married filling jointly couple maxing out their 401k’s. Your taxes may vary significantly from these numbers based upon your individual circumstances. For example, Justin at Root of Good was able to pay close to $0 in taxes even with a household income of $150,000. Notice that even at very high incomes, due to the high savings goals and much higher taxes, yearly allowable spending (“lifestyle”) does not actually increase in direct proportion to your income. Also note that if you earn a very high income but manage to spend less than the yearly allowable spending (i.e., you save >50% of your income), then you will reach financial independence that much sooner. What happens when you reach financial independence? If you carry on saving 50% of your income for approximately 17 years, you will have saved around 33x your yearly spending. At that point, using the 3% rule, you will be financially independent. 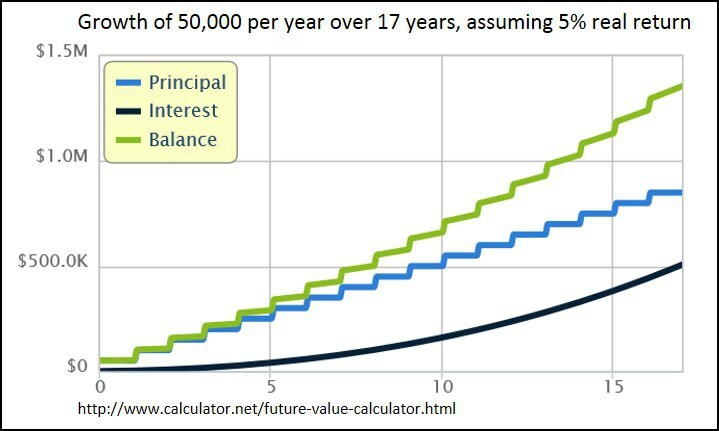 For example, if your household income is $100,000 per year, and you save $50,000 per year for 17 years (while living on $40,000 per year, as above), you will have around $1.4 million (assuming a 5% rate of return). $1.4 million is a little over 33x your yearly spending of $40,000 per year. Congratulations! At financial independence, you have a few options (actually, many options). If you are comfortable spending $40,000 per year for the rest of your life (adjusted for inflation), then you no longer have to work. However, if you enjoy working and want to continue, then your nest egg will continue to grow. As your nest egg grows, you will be earning the right to spend more and more per year. For example, if you grow your nest egg from $1.4 million to $2 million, you have earned the right to inflate your lifestyle to $60,000 per year. If you can grow it to $5 million, you have earned the right to inflate your lifestyle to $150,000 per year. Lifestyle inflation becomes a problem when you haven’t actually earned the right to inflate your lifestyle. However, if you find ways to increase your income (while still saving 50%), OR you have already reached financial independence, and your nest egg continues to grow, then feel free to increase your lifestyle accordingly. In that case, you’ve earned it. “Live Free MD” is a sports medicine physician who blogs at his self-titled site, Live Free MD. Physicians: Get rid of car debt. Or, how to buy a car with cash.